Imagine looking down on the Solar System from above. Each planet would orbit around the sun in with its own speed; Mercury would move the fastest, Neptune’s slow motion would hardly be perceptible. If you were able to rotate your view to match the motion of one planet around the sun, then that planet would appear to stand still while the rest of them would continue their relative motions. In 1772 Joseph-Louis Lagrange demonstrated that, for planets on circular orbits, there are five special locations where if you start small bodies in precisely those positions they will continue to orbit around the central object in a fixed pattern, maintaining their relative positions to both the planet and the Sun. These five points became known as the Langrange points. 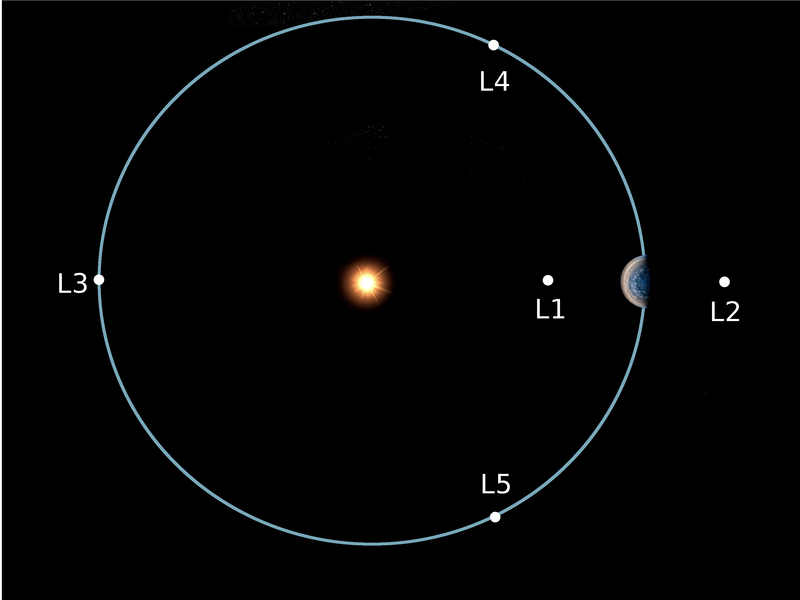 The location of the five Lagrange points, not to scale. It later was shown that if objects are not in precisely the right positions then an object at the first three Lagrange points will wander off. While we can place objects in these Largrange points (for example NASA’s Solar Heliospheric Observatory (SOHO) and the Deep Space Climate Observatory are currently near the Earth-Sun L1 point and the Wilkinson Microwave Anisotropy Probe (WMAP) is near the Earth-Sun L2, and the James Webb Space Telescope will join it soon) a spacecraft must actively correct its course every so often to stay near those points. However, objects can stay in the vicinity of the L4 or L5 points forever with out any adjustments. That means that the while only objects near the first three Lagrange points are ones that humans put and actively keep there, natural bodies can be found orbiting various L4 and L5 Lagrange points throughout the Solar System. Asteroids that orbit a planet’s L4 or L5 Lagrange points are known as Trojan Asteroids. The first (and currently most) known Trojan Asteroids are located around the Lagrange points of Jupiter. The Lucy spacecraft will fly through both of Jupiter’s L4 and L5 Trojan swarms.